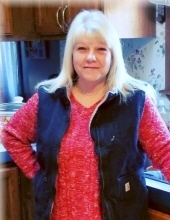 Bobby Sherri Ball, age 50, of Admiral Lane, Williamsburg, Kentucky departed this life on Sunday, April 14, 2019 at the home of her sister. She was born on April 14, 1969 in Williamsburg, Kentucky to the late Ronnie Surgener and Margaret Faye (Steely) Satterfield. In addition to her parents she was also preceded in death by her grandparents Margaret and Joe Thornton and her brothers, Randy Baird and Robbie Keisling. She is survived by her husband, Bob Ball of Williamsburg; children, Ronnie Allen Hatfield, Dalton Ray Hatfield and Emily Joy Perkins of Williamsburg; stepchildren, Bobby Ball (Tiffany), Brandon Ball (Courtney) and Christopher Allen Ball of Williamsburg; grandchildren, Liam Bentley Cole Hatfield, Bobby Ball, Ellie Ball and Hagan Ball; two sisters, Pamela Jones of Nashville, Tennessee and Terri Ballard (Jerry) of Williamsburg; three brothers, Rust Baird (Julie), Harold Keisling and William Creed Keisling of Williamsburg; several nieces and nephews; and a host of other family and friends to mourn her passing. Visitation will be after 5:00 P.M. Friday, April 19, 2019 at Croley Funeral Home. The Funeral Service will be at 11:00 A.M. Saturday, April 20, 2019 at the Croley Funeral Home Chapel with Rev. Harold Long and Rev. Chris Brock officiating. Following the Service she will be laid to rest in the Ballard Family Cemetery. To send flowers or a remembrance gift to the family of Bobby Sherri Ball, please visit our Tribute Store. "Email Address" would like to share the life celebration of Bobby Sherri Ball. Click on the "link" to go to share a favorite memory or leave a condolence message for the family.